My photo of the day: Tiya Chowdary, competing in the Girls 10-11 age group, had a photo taken with an agreeable Masters defending champion. 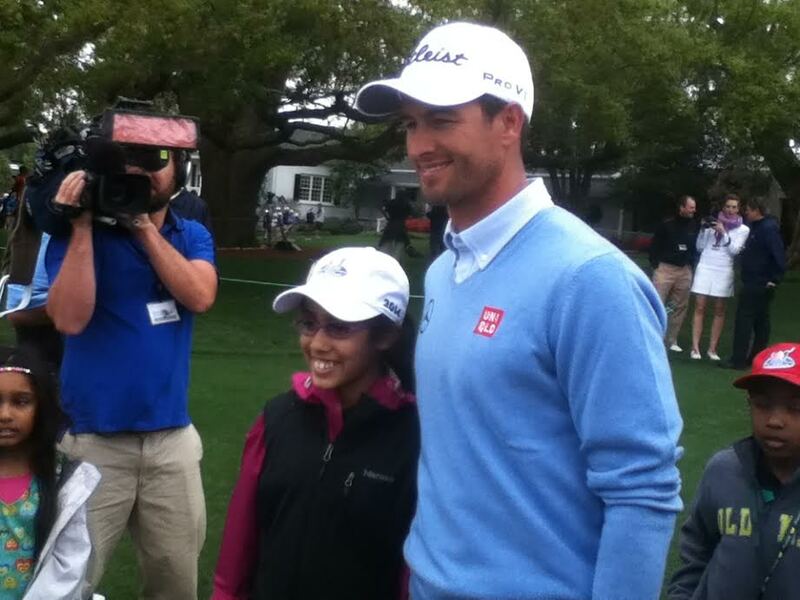 From NJ, Tiya is a 5th grader who joined her father at a driving range at age 3; attended an LPGA event at 5, and now has a photo with Adam Scott at 11. On his way to the putting green, Scott also took time to sign a number of autographs for youngsters and their families. Classy. I loved how a number of players in the Masters field stopped and caught some of the competition. While some of them were practicing in a designated area anyway, Bubba Watson spent at least 15 minutes watching several of the juniors competing in the long drive event. In fact, he watched Amanda Gartrell,15, hit it 225 yards on her best drive. In her bio, Amanda listed Watson as the “coolest person.” Here’s hoping they were introduced. Attention to detail: nice touch for the juniors to be issued a player’s pin a la the Masters pin for “older” players teeing up this week. By the way, the young players were asked to dress in khaki in pre-event instructions. I only saw one youngster dressed in shorts altho the weather was chilly when the event began at 7:30 a.m. Masters officials nicely allocated designated viewing areas and reserved seating for parents and family members. Technology: not sure how it’s done but it’s amazing how the measurements are digitally and virtually tabulated for the various events without the use of any “hard” devices. Gee, I recall those good old days of Augusta National chairman Hord Hardin using the flagstick and an envelop to measure the “who’s away” distance on the 11th green during a fateful Masters playoff. “Good thing it hit the cup!” That’s what’s Patrick Welch told me one-on-one about his winning 15’ putt on the 18th green at Augusta National. He was one of two age group winners holing out in the last stage of competition. “Because I was leading at the time, I knew I just needed to get it close to win. But then I hit too hard. Good thing it hit the cup.” Honest young man. Welch also won the long drive competition with a poke of 253.6 yards. And shades of the late Senior player Charlie Owens, Welch plays the game cross-handed! Hinge and hold: With only a few exceptions, most of youngsters I observed in the chipping stage used the Phil Mickelson-endorsed “hinge and hold” methodology. Most players used wedges to get the ball elevated and with some spin on the fast greens. Not phoning it in: Augusta National member Condoleezza Rice announced the names of the juniors for their final 15′ putt. But before doing so, she double-checked the pronunciation of certain youngsters’ names; many times inquiring directly with the boy or girl. Rice was considerate and careful in her preparation. Hey, John Travolta at this year’s Oscars, please take note. After the Press conference with the age group winners, Masters chairman was asked if an international DC&P competition might be in the future. “Well, we just finished this one so it’s too early to talk about that…but it was interesting to see some Canadian youngsters in the event.” Payne was also asked if Augusta National would ever entertain hosting a women’s professional tournament. He politely dismissed its chances given the limitations of the private club’s golf calendar (hey, members want to play their course!) and the staffing, time and resources required for staging another major event. And anything at Augusta National will be a major.